Whether in Uganda, Rwanda, or the Democratic Republic of Congo (DRC), there is a sequence of daily events in the lives of every individual mountain gorilla family; with a few spontaneous happenings coming in once in a while (like fights and deaths, or visiting guests’ lodges). If tourists were allowed to participate in a full day habituation process, they would be able to follow along from the time the gorillas kick off the blankets, to the time they lay down to rest. Today we will discover what mountain gorillas usually do in their forested mansions. Early in the morning at around 6:30 am, mountain gorillas arise together with the morning sun. At this time the male leaders immediately begin to think of what the day will look like. Sometimes they wake up and eventually break the nests in which they slept the previous night; a behavior that is common to most of the big apes (like man’s closest relative the chimpanzees) which do not sleep in the same nest for a second night. Gorillas won’t waste their time in grabbing a tooth brush to clean their teeth but they immediately begin to ask their alpha where the day’s breakfast will come from. At this time, most of the younger members in the family; who are often impatient to hear what their alpha has to say, begin to cling onto their mothers and trace for the milk-filled breasts; which is actually what they love to do most at this age. After several hours of consuming, and when all family members have had enough to eat, they prepare to rest. Some gorillas may take a nap while others may just sit still and laze as the digestive system does its work. It is during these resting times that the younger gorillas (especially the juveniles) play their games which often include somersaulting, wresting, and chasing one another; like they were practically saying “you can’t catch me”. 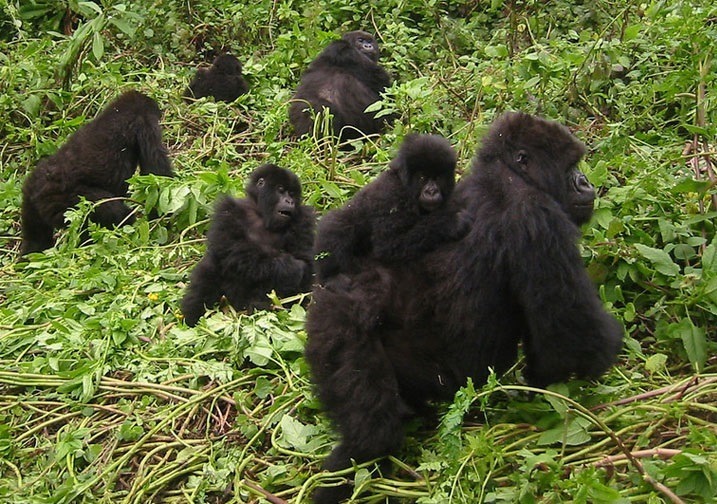 With assurance that the little ones are away, the adult mountain gorillas (males and females) begin to socialize and strengthen bonds or even make new ones. Females who do not have babies to attend to get the opportunity to spend a few moments with the males in the family, and in the process new babies are made. After the food has sunk deep into their bodies, the family begins to forage again and they eat-up until they are full to rest again in the later hours of the afternoon. When the sun grows weary at around 6:00 or 6:30 pm, mountain gorillas look for a comfortable and secure place to build new nests for the night (this process is called nesting). This is a tedious activity, but unavoidable because according to the mountain gorillas sleeping comfortably is high on the list. Every individual builds his own nest exclusive of the infants who get the privilege of sleeping with their moms. When the nests are ready (it is pretty dark at this time) gorillas begin to say their “good nights” and then tuck themselves into the nests, which they will actually sleep in for a single night. Most of the members will sleep like babies but the alpha silver-back often wakes up throughout the night to ensure that no one is messing around with his family.